إن فندق شقق آيبانيما هوليداي بموقعه الممتاز في هذه المنطقة السياحية هو نقطة انطلاق جيدة لنزهاتك في هذه المدينة المذهلة. يحظى هذا الفندق ذو 4 نجمات بمكان ممتاز يسمح بالوصول إلى المعالم السياحية الأكبر في المدينة، فهو يبعد مسافة 1 km عن صخب المدينة. سوف يعشق النزلاء موقع هذا الفندق، فهو قريب من أهم المعالم السياحية في المدينة . إن الخدمات التي يقدمها شقق آيبانيما هوليداي تضمن للنزلاء إقامة مريحة. يمكن للنزلاء الاستمتاع بالميزات التالية: صف السيارات, التوصيل من وإلى المطار, رعاية أطفال, غرفة عائلية, مرافق للشواء أثناء إقامتهم في هذا المكان الرائع. يمكن للنزلاء الاختيار من ضمن مجموعة من الغرف المصممة بعناية لتعكس جواً من الراحة، والتي يتجاوز عددها . إن مركز للياقة البدنية, ساونا, مسار جولف - ضمن 3 كم, حمام سباحة خارجي, سبا هو المكان الأمثل في الفندق للاسترخاء وتفريغ طاقتك بعد نهار طويل. مهما كانت أسبابك لزيارة المدينة، فإن شقق آيبانيما هوليداي هو الخيار الأفضل لإقامة مثيرة وممتعة. تُطبق شروط إضافية على استخدام الواي فاي. يرجى العلم أن العقار لا يضمن تنفيذ إعدادات الأسرّة عند حجز شقة ستوديو. تتوفر خدمة الواي فاي غير المحدودة في الرُدهة فقط. الواي فاي غير متاح في الطوابق. Great hotel accommodation, better than expected with awesome sauna, spa and pools, friendly staff and great rooms. 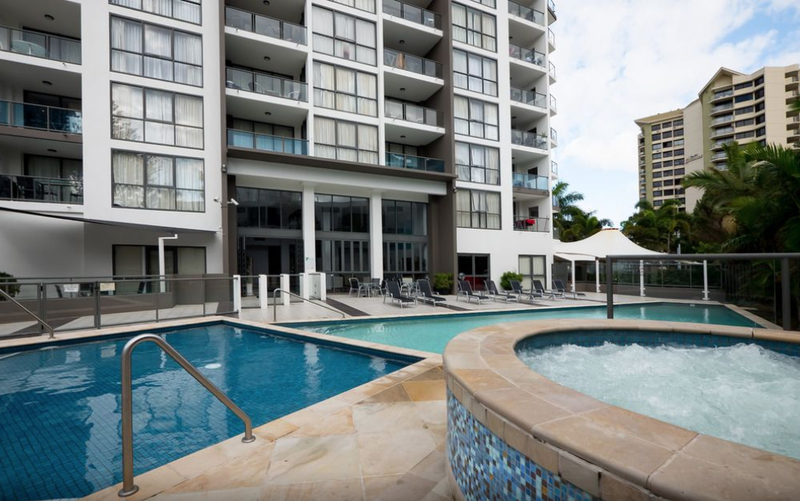 Was a really enjoyable stay, loved the close vicinity to Surfers Paradise and tram services, loved the access to washing machine and dryer which was only shared with 1 other room and located in an area that was locked to any other guests. Really looking forward to coming back with my son's and enjoying another stay here in the near future. I booked in for two nights, arriving before check-in time and leaving after check out time. The gentleman was more than helpful, he allowed me to park my car under cover until I was finished with my business meetings, saving me time and money looking for other parking. I will definitely be back. I will recommend Ipanema to my friends as a convenient clean place to stay. I should also mention the great pool and gym. This nightmare started off the night we checked in (approx. 9pm). Receptionist was not there (never saw a receptionist there for the 4 days we stayed). The man who worked at the hotel who did odd jobs was there to assist us and check us in (he spoke poor English and was very difficult to communicate with him, he was nice but he could barely understand anything). We booked through Agoda for 2 rooms using the same name, paid by separate credit card and obviously separate booking number. He could only find ONE booking and could not for the life of him find our other booking. He asked if we (4 adults) were willing to all stay in one room (1 double bed) as they had no rooms left. First of all, where is the logic behind this? HOW ARE 4 ADULTS SUPPOSED TO SHARE 1 QUEEN BED? Conclusion: the hotel messed up and saw the 2 booking numbers were very similiar and thought it was the same booking so only allocated 1 room.. Dirty curtains, microwave, wardrobes and bedbase. Uncomfortable pillows. The only good thing we found was the size of the bathroom. Lovely place. Didn't expect them to also have a washing machine and dryer but that was a pleasant surprise (could do some laundry so I don't have to 'recycle' some old clothes). Only a few suggestions: - room had everything I needed except a hair dryer. Had to request for one. - if you want your room cleaned, you'll have to explicitly request it. - stove available but maybe you can provide a frying pan / pots. I didn't require it (didn't cook for this trip) so not sure if you could request it at reception. - open the curtains and you'll have a good view of the surroundings (ocean a bit further away). - some nearby restaurants and convenience stores around. - friendly staff. I would recommend this place. I felt like I wanted to stay longer. We had two great balcony views and the hot tub was great after a long day. We enjoyed and if we ever came back for a longer stay, I would consider staying there once again because it had all that you needed. Ipenema is located in an excellent location, opposite Florida Gardens light rail and an easy walk to either Surfers or Broadbeach. My apartment was exceptionally well furnished with a balcony that offered “ to die for views “ The staff were extremely friendly, check in was lightning fast and it was hard to beat re value for money.. The Ipenema is centrally located equidistant between Surfers and Broadbeach. The apartment is very modern and provides seperate lounge, dining ,bathroom add a ful l kitchen with oven microwave and two balconies offfering magnificent views. The staff are extremely friendly and check in was absolutely seamless. Thoroughly enjoyed my stay and have no hesitation rating this apartment/ hotel as one of the best on the coast!! Was a good stay from 9th Nov 2018 till 14th Nov 2018, walking distance to surfers paradise and to other places by drive was not bad at all. Had good experience staying in Ipanema. Only if Wifi access was till room would have been great, as i only could access once in ground level and had to stay up late for it. Maybe can add more thrash bin at several areas for disposal of tiny wastes while walking in and out of the building. besides it, EVERYTHING WAS FABULOUS. I booked Ipanema apartments as a last minute thing for 2 nights. I checked in late and although reception was closed, a lovely gentleman came down to greet me and check me in. The apartment itself was clean, modern & very spacious for a 1bedroom. It also had 2 balconies which was a nice bonus. Although it wasn’t swimming pool weather, the hotel had 3 pools I believe which you don’t often see in this area. I was fortunate enough to meet the manager who was very kind and helpful, as well as another lovely lady on reception; who was also very accommodating & helpful. Parking was included and the apartment is in the middle of both Broadbeach & surfers which were in walking distance. I’d definitely recommend this place; the cheap price was just an added bonus. We booked for a quick weekend get away. unfortunately for us the weather was rubbish but the apartment was not. only issue was there wasnt enough blankets, in fact there was only 1 on the bed, no spares in the room. and being that it was a cold weekend this sucked. but apart from that, would recommend to anyone looking for a cheap getaway. In this day which accommodation provider is ballsy enough to not have free wifi, and on top of that only offer incredibly poor value paid subscription services. Decent place let down by this one fatal flaw. Great location - situated between Florida Gardens & Northcliff Tram stations. Close to the action at Surfers. Walking distence to the beach. Only drawback; Too soft pillows & you have to dispose of your own garbage or lose your deposit. Its location is good laid by the Surf Paradise, there is tram station closely while I can easily go City Centre and Airport either. There is good window view for most of their rooms and there is also a nice swimming pool at the ground floor. The reception is super friendly including the staffs. We feel welcomed. Location is a little far from surfers paradise but other then that everything is okay except that we need to throw our rubbish ourselves or we will be charged and cannot make the room messy at all. Everything there is all about charges. We travel a lot and this is the first place we stayed where the staff were sp unfriendly. We supposed have access to internet and it never worked, when I asked to solve the problem I've been told " I have more things to do"